Jack Nicklaus returns to headline the 3M Oil & Gas Greats of Golf Saturday afternoon, teeing it up alongside fellow legends Gary Player and Lee Trevino in an 18-hole scramble format, as part of the Insperity Invitational on the Champions Tour. The event—played at The Woodlands Country Club outside of Houston, Texas—is a trilogy of sorts, following the first-ever Greats of Golf event held in 2012, which Nicklaus won with then-playing partners Arnold Palmer and Gary Player in a thrilling 11-under performance. The televised Greats of Golf competition will be aired as part of the Golf Channel’s regular broadcast of the Insperity Invitational. TV times for today are from 7:30 to 9:30 p.m. ET; Saturday from 6:30 p.m. to 9:30 p.m. ET; and Sunday from 7:00 p.m. to 9:30 p.m. ET. As with most “great” events—the Greats of Golf keeps getting better. The 2012 event was supposed to be a one-time-only occurrence, but strong demand called for an encore as a gallery of about 40,000 people turned out to watch the incredible display of golf history and rekindled shot-marking. Another popular and successful 2013 Greats of Golf event led fans to beg for a third. And, based on his two other appearances in the Greats of Golf, fans can expect Nicklaus to make another run this weekend, but most important, have fun with his long-time friends and competitive rivals. The Golden Bear’s team finished second, four strokes back, in their 2013 encore. Nicklaus, Player, and Trevino will compete against two other threesomes: Raymond Floyd, David Graham, and Don January; and Tony Jacklin, Johnny Miller, and Dave Stockton. The stellar group includes seven World Golf Hall of Fame members and has combined for more than 300 PGA TOUR victories, over 50 major championship titles, and more than 150 Champions Tour wins. Nicklaus himself has the lion’s share, with a record 18 majors in his storied career, as well as 73 PGA Tour victories. Nicklaus also won 10 times on the Champions Tour—then known as the Senior PGA Tour—including a record eight senior majors. This year, Palmer will not compete, but instead will be in attendance, serving as an honorary chairman. The last time Nicklaus joined Palmer and Player was to open the 78th Masters Tournament on the first tee at Augusta National. Then, the Golden Bear took bragging rights amongst golf’s “Big Three” when he threaded the middle of the fairway with his Nicklaus Black Golf Ball to edge his close friend Gary Player by a couple yards. The Nicklaus Black Golf Ball will be put into play again Saturday, and has already been weaved into the Insperity Invitational, as more than 700 amateurs received the new Nicklaus Black Golf Balls as part of their Pro-Am gift package this week. The ball was first put into competitive play in December at the Father/Son Challenge in Orlando, when Jack teamed with son Gary. The Insperity Invitational offers free grounds-only admission tickets, courtesy of Insperty. Players will compete for a purse of $2 million during the Champions Tour event, which features the world’s premier 50-and-older golfers. 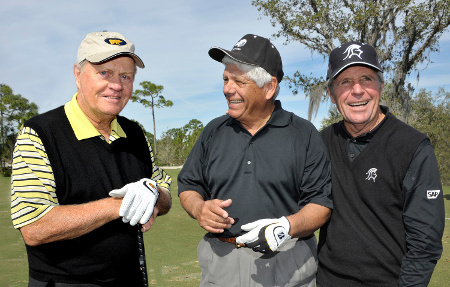 For Nicklaus, Player, and Trevino, they simply hope this golden reunion will lead to some crystal, as it did in 2012. For more information on the Insperity Invitational and the 3M Oil & Gas Greats of Golf, visit insperityinvitational.com.